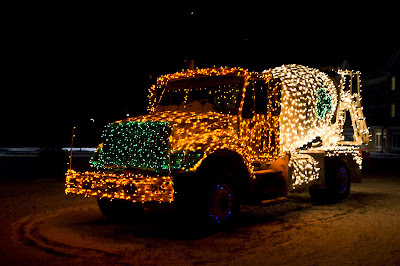 This time of the year, the SD Ireland cement company is known for decking out their cement trucks with X'mas lights and displaying them around town. It's really neat to see them driven around while the cement mixers are turning with the X'mas lights on. I have no idea they do that! I caught this truck a few days ago as I was heading home from work. Awesome, I'm glad that you were able to get this photo. I have been trying to describe this to some people.